Location, Location, Location! This boutique building has everything you are looking for. Walking distance to the beach, trendy shopping and some of the best dining on West 4th! This is your opportunity to experience the Kits lifestyle. 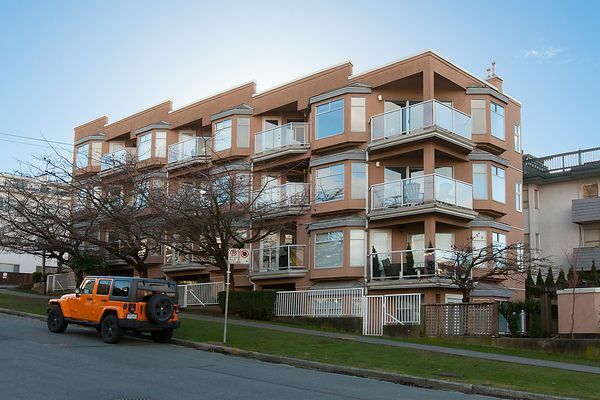 Urban and Chic, this 2 level townhouse style apartment has its own separate entrance. Hardwood floors throughout, this home features 2 bedrooms and 2 full baths. Major renovation in 2006 and then more recently in 2013. Master bedroom oasis is on the lower level which has great closet space, heated floors and nicely updated ensuite. Gorgeous kitchen has granite counters, s/s appliances and is perfect for entertaining! Living room consists of gas fireplace and access to your own private balcony (BBQ's allowed). New roof in 2008. One pet allowed. Comes with 1 parking and 1 storage locker. Bonus! Your friends can stay - $25/day guest bedroom available to the owners in this building.